Okay you all...ready for a chance to win your very own Flexi Clip?! Full disclosure: in exchange for this review, I was given a free Flexi clip and two bobby pins. Opinions are all my own. I've been wanting to try a Flexi Clip for a while, so when Mandi was looking for reviews, I happily offered!! 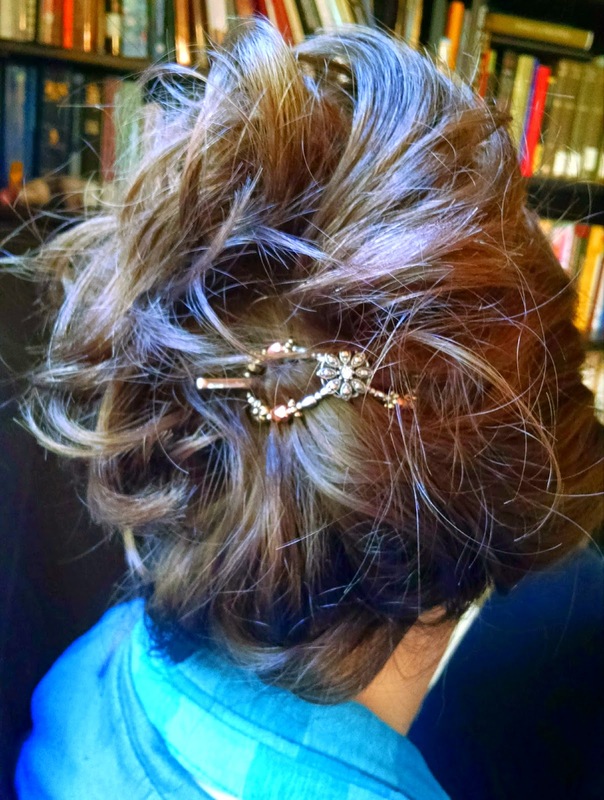 For those of you who aren't familiar with Flexi Clips, they are one of the many beautiful hair products made by Lilla Rose (you can click on that link to browse their website). 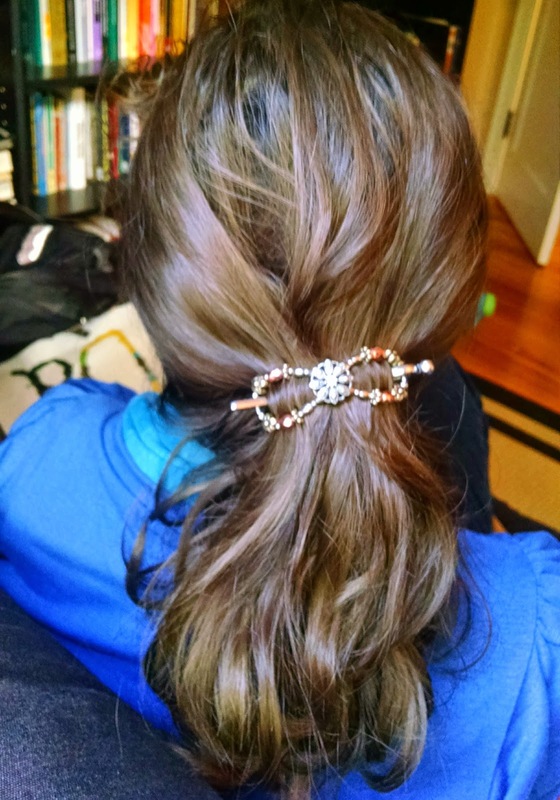 Lilla Rose makes bobby pins (a couple of which Mandi sent along for Therese! ), hairbands, You Pins, hair sticks, the Flexi Oh!, and, of course, Flexi Hair Clips of all sizes and styles! 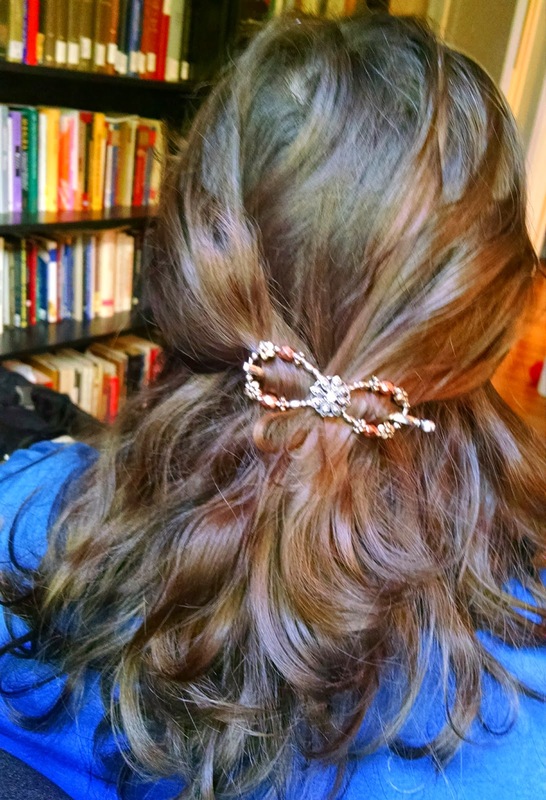 For my review, I selected the Flora Metals Flexi Hair Clip, size small. Mandi sent along helpful guide to figure out which size clip would be right for me. So, a quick preface about my hair type. From the time I was small, I had naturally curly hair. But, after my last pregnancy with Maria, my hair became more wavy, and it is now in the process of turning curly again. Whew! That being said, my curls are and always have been of the looser variety, not corkscrew. When my hair behaves itself, it can look quite lovely. But a lot of the time, I find myself trying to tame the frizz beasts and I've been trying out some different hair products to help with that. Living in Missouri, with its abundant humidity, doesn't really help matters! My hair isn't thick, but it also isn't thin. So I really had to think about what hair styles I wanted and which size clip would work best for me. I think that if I had hair with a more consistent texture and thickness throughout, it would have been a lot easier to select a clip size. I think I was hoping that I would be one of those lucky few who only really needs one size flexi clip to accommodate all their hair styles...but that I am not! I realized that I may eventually want to get a smaller flexi for the half pony tail style, and I may need a medium-sized one for a swept up look. Because my hair gets thicker as it goes down - very fine and only slightly wavy on top and then thicker and curlier as it falls - it's just tricky to find clips that work well! That being said, I am trying to grow out my hair a bit, and I was really needing a good hair clip to keep it pulled back from my face. I needed something softer and more flexible, since I still lay down to nurse Maria a few times a day (and the harder hair clips tend to dig into my scalp when I do that). But I also needed something that would stay secure, and not come undone or pop open in the course of taking care of my little ones. I am happy to say that my Flexi Hair Clip met both those criteria! I love that, even though it is a metal hair clip, it is so flexible that it doesn't really dig into your scalp. It moves with you! When I lay down to nurse Maria, or to take a nap (which is basically a must when you have a teething baby!) I can leave my Flexi Clip in, and it's so comfortable that I often forget that I'm wearing it. BUT it also holds my hair really well throughout the day, while we're doing school, or while I'm cooking or cleaning or writing or sewing or going for a walk...or whatever I have to do! Because of my hair type, it can be really hard to find a hair clip that holds on to my hair throughout the day, but the Flexi seems to hold up better than most. Aside from all that...isn't it also just gorgeous? I feel more beautiful and put together when I'm wearing it! I love that I can wear it everyday, but that it's also fancy enough for Mass or special occasions. Mandi would be more than happy to help you select and purchase a Flexi Hair Clip of your very own! You can find her on her website, on Facebook, or Instagram. For more about the story behind Lilla Rose, you can read the history of the company, or check out their promo videos on Youtube. 1) Visit the Lilla Rose website and come back here and leave a comment telling me which Lilla Rose product you would pick if you won! 2) For an additional entry, like Mandi's facebook page and come back here and leave a comment telling me you did so. Good luck, friends!! Giveaway open until the end of All Saints Day, Saturday, November 1 at 11:59 p.m. I just started reading your blog a few months ago and I really love it. I would really like to try the Flexi Clips. I am always looking for something to do with my very long, thick hair! The daisy flexi clip is one of my favorites. And i liked Mandi's page. They are beautiful and well made! I love the Marrakesh Romance and I liked Mandi's page too. I like Copper Rose and the November FOTM. Debating - either the Marrakesh Romance flexi clip or the Celtic Knot in black nickel. There are lots of great choices!